Provide some basic information and get a real-time credit decision to split your purchase into monthly payments. 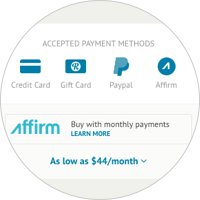 Simply pay your monthly bill using a debit card or bank transfer at affirm.com/pay. How do I find items I can buy with financing? Simply search for the gear you're looking for and check the "Has Payment Plans" checkbox in the left sidebar to see the gear that accepts Affirm. Are you a seller on Reverb that wants to offer Affirm payment on your listings? Turn it on by enabling Reverb Payments in your payment method settings. Please note: Not all offers and discounts are available with all sellers and listings. See seller and listing pages for details.. 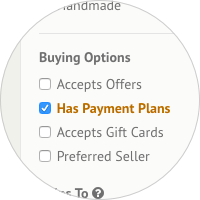 When you're on a listing page, look for the Affirm badge alongside the other payment methods accepted by the seller. You might not see Affirm available on all of their listings though, as financing is only available on items with a purchase price over $150. Affirm is only available to United States residents 18 years or older. Shipping and billing addresses must be located within the US. Affirm financing is only available on items over $150 at this time. Learn more on the Affirm website, check out the Affirm FAQs, or get in touch with our customer engagement team. Want to start accepting Affirm in your shop? Are you a seller looking to grow your sales? Turn on Affirm for your listings by enabling Reverb Payments in your payment method settings. Buy and receive your purchase now, and pay for it over six, twelve months, or 18 months. This allows you to split up the price of your purchase into fixed payment amounts that fit your monthly budget. Affirm will ask you for a few pieces of personal information – your name, email, mobile phone number, date of birth, and the last four digits of your social security number. Affirm uses this information to verify your identity, and to make an instant loan decision. Affirm will base its loan decision not only on your credit score, but also on several other data points about you. This means you may be able to obtain financing from Affirm even if you don’t have an extensive credit history. Enter the authorization code into the application form. Within a few seconds, Affirm will notify you of the loan amount you’re approved for, the interest rate, and the number of months you will have to pay off your loan. Rates from 0-30% APR over 3-18 months depending on the seller and based on creditworthiness. Affirm will also state the amount of your fixed, monthly payments and the total amount of interest you’ll pay over the course of the loan. When you first create an Affirm account, we perform a ‘soft’ credit check to help verify your identity and determine your eligibility for financing. This ‘soft’ credit check will not affect your credit score. If you apply for more loans with Affirm, we may perform additional ‘soft’ credit checks to ensure that we offer you the best financing options possible. Regrettably, Affirm is available only to shoppers residing in the United States. Affirm hopes to expand its services to customers outside the U.S. in the future. Rates range from 0-30% APR and 6, 12, or 18 monthly payments based on creditworthiness. Affirm discloses any required fees upfront before you make a purchase, so you know exactly what you will be paying for your financing. Affirm does not charge any hidden fees, including annual fees. *Previous purchases ineligible for offer. Down payment may be required. For purchases under $150, limited payment options are available. Affirm loans are made by Cross River Bank, a New Jersey-chartered bank, Member FDIC. When determining your annual percentage rate (APR), Affirm evaluates a number of factors including your credit score and many other pieces of data about you. If you finance future purchases with Affirm, you may be eligible for a lower APR depending on your financial situation at the time of purchase. When considering Affirm, you should carefully evaluate the loan terms Affirm offers you and determine whether the monthly payments fit your budget. Affirm calculates the annual percentage rate (APR) of a loan using simple interest, which equals the rate multiplied by the loan amount and by the number of months the loan is outstanding. This is different from compound interest, in which the interest expense is calculated on the loan amount and also the accumulated interest on the loan from previous periods. You can think about compound interest as “interest on interest,” which can make the your loan amount grow larger and larger. Credit cards, for example, use compound interest to calculate the interest expense on outstanding credit card debt. You should see a refund from Affirm post within 3 to 10 business days, depending on your bank’s processing time. How do refunds work on items I return? A refund will post to your Affirm account if we process your refund request. In the event that we issue you store credit instead of a refund, you will still be responsible for paying off your Affirm loan. If you have already made loan payments or a down-payment, Affirm will issue you a refund credit to the bank account or debit card that you used to make the payments. You should see a refund credit within 3 to 10 business days, depending on your bank’s processing time.